Yes, you, still in your sweatpants and un-showered, hours into your day. This love note is for you. Between seven a.m. when they wake, alert and ready to tackle the world and you and any sibling that accidentally touches the edge of that notebook that one-time a long time ago used to be theirs, and lunch you will field dozens of questions. The shade snapped, up, when seven arrived and you’re right in the thick of a motherhood that looks a lot different than when you prayed for their hearts in the dark, just a few minutes earlier. In your mind, they were quiet and jammy-clad with the night weighing down their eyelids — and you poured out quiet prayers for their souls. With seven a.m. came bodies that bolt and jump and climb right out of that placid sleep and into dress-up clothes and dolls and drama. The older ones, they wear their layers — maybe not as loud on the outside but roaring beneath their skin. Where the littles count minutes until snacks and sweet treats, these older ones they hunger, too. They’re hungry for answers to all the questions you’ve just barely had answered yourself and the ones you’re still asking. You see them, awkwardly fumbling through who they are and who you’re not and trying find their one niche in a world that doesn’t know them but wants to own them. Each child is a bell and they ring with their needs, sometimes all together. All at once, this loud cacophony of sounds and needs and aches and you wonder how in the world God even allowed for a mother, much less you. They all need Him. Those bells, they ring and remind and hang out in your once-quiet space. All of them are needy for way more than your frame — still ringing its own bell of need and ache and hunger — can supply, yet they call you Mommy. 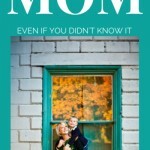 So, you, the world wants to tell you that Mommy is that one who is harried and stressed and all caught up in worry. She’s the one who’s put all of herself on the shelf — though still not completely sure why — to tend to the myriad of needs she’ll never meet, but will certainly grumble about later. Mommy, to the world, means supplanted and second-class and just-can’t-wait-to-get-out-of-that-baby-stage-and-really-live. Mommy is something to endure, according to the world. She can’t wait to climb out of her skin and find passion, again. She wants to be led by love, but is trapped in a season where duty trumps all. Her sweatpants are an appropriate uniform. But you want to know the truth about this season for her, for this Mommy? For you? You barely step outside your bedroom door to referee a squabble and another child’s broken a glass, downstairs, and the baby is crying — all at once — and there’s a Face behind that moment. You see that moment as loud and disruptive, but He has removed your ease so that you might find something better. As I pour myself out over disparate legos and another broken glass and hours of referring squabbles, there is a concurrent story. The hot pursuit of a Love that shows up in the unlikely, just to show me that He is more than a God to be studied, but one to be encountered. So, you, mama, let go of the lie you’ve believed. 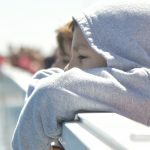 Ease isn’t the gift for the mom to hold out in front of herself like a carrot, counting the days she moves closer towards that as her babes move out of diapers and into big beds and onto college, out of the house. Ease is the enemy of the mother who really wants to fall in love with God. 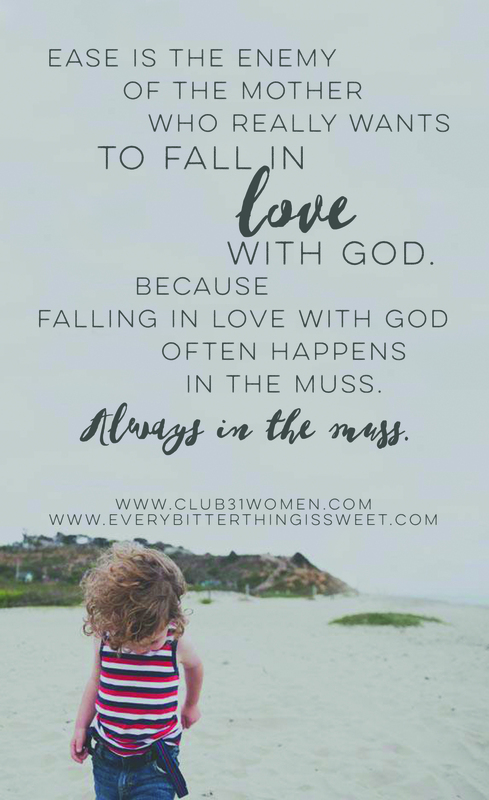 Because falling in love with God often happens in the muss. Always, in the muss. It starts with one encounter. One quiet (or loud) whisper in the middle of the crazy-mundane can make me lift my eyes and even shudder at how near He is to me. This day — this long day where I crawl into my bed and wonder if I can do it again tomorrow — is the day the Lord has made. For me. It’s my day to say, God, show Yourself as so near to me. Let me feel Your breath on my skin, today. It’s my day to fall in love, right here in my sweatpants. 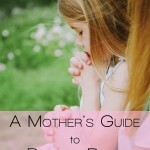 Post originally posted on Mothers of Daughters. Yes, they are ours for a short time. May we point them to the One who can fulfill all their needs! this is perfect- thank you. My life for the past two weeks! There have been days when I’ve wondered if I could make it till bedtime…just willing it to come, watching the clock closely. But this motherhood thing…what a blessing despite the many challenges. Thanks for this. It helps me keep my priorities on track. So very true. I can attest to every word. Beautiful!!! and I love your book, Sara! I so needed this. Thank you! I have a 3 1/2 yr old, 2 yr old and 4 month old and sometimes I just really need another set of hands. I love my little ones and want to give each of them what they need and sometimes that doesn’t seem possible. 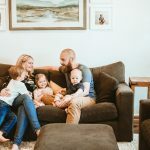 And I frequently find myself fighting the mindset of motherhood that the world gives. Thank you for your words. Such beautiful truth. Thank you, Sara!